Tova Weinstock has been cleaning and organizing since she was a child. In the years since, she’s morphed her job as a freelance house cleaner into a full-time gig as a professional organizer. 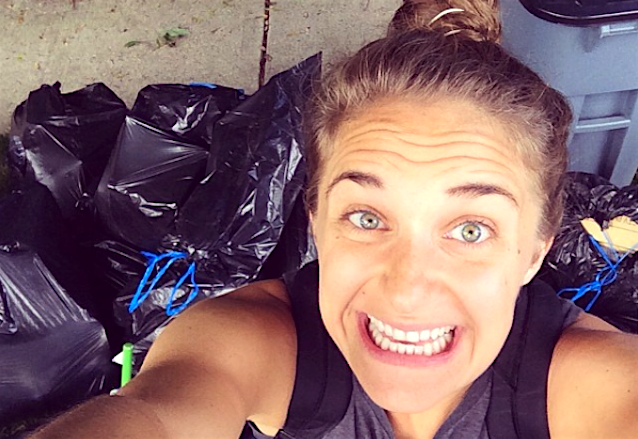 Today, the 28-year-old charges $150 an hour to help people organize their closets, pack and unpack during a move and, generally speaking, declutter their lives. Affectionately known by her clients as “Tidy Tova,” Weinstock lives in Brooklyn and makes between $55,000 and $65,000 a year. Weinstock’s first hint that organizing might be a viable career path came to her while she was cleaning apartments in New York. She launched her professional organizing company a little over three years ago and began building her client base through referrals and by sharing organization advice on her blog. She also writes about tidiness for various publications. “Things have just snowballed,” she says. Weinstock typically works Sunday through Friday. Although she’s always thinking about how to build her brand (she also wants to write a book about organizing), she tries to take Saturdays off. She’s already thinking about her business’s next phase, toying with the idea of hiring someone to work under her. Because she works with the “chronically disorganized,” many of Weinstock’s jobs are booked somewhat last-minute. Though her clients vary, many are women. Frequently, they’re young moms or pregnant women who are nesting and preparing for a baby. She often works with New Yorkers, but Weinstock says she’ll travel anywhere to work with a client, as long as they cover the cost. Weinstock can spend a range of time with a client, from one long afternoon to several full days. Her average job is 10-12 hours long, but she also works with clients who want to declutter a specific area, which requires four to six hours of her time. She’s also stayed over at a client’s home and worked for four days to complete a more intense project. She likes to work quickly and finish each job before she starts a new one. As odd as it may sound for business purposes, Weinstock’s goal is for a client never to need her services again. Working with the client, she assigns a home for every object in their home — yes, every object — and hopes they maintain that system after she leaves. “I do have clients who I’ve been with for years call me back maybe every six months, which obviously is not the ideal because those clients are struggling to maintain those systems and just that mindset that I try to encourage,” she says. Weinstock explains that many of her clients are really looking for a lifestyle change — one involving fewer material goods, less clutter and less time spent looking for things. She tries to convey her own life philosophy to them: Simpler is better. “I do try to encourage people to move forward consciously, not like they used to,” she says. Weinstock says she works side-by-side with clients to figure out the best way to organize their belongings. Together, they work systematically through the space, making sure to purge anything the client deems unnecessary. They talk about how frequently the client uses an item before deciding where to store it. “I am good at reading clients’ interactions with their things and encourage them to let go of items that they clearly don’t use or feel bogged down by,” she adds. There’s a unique need for a professional organizer in New York City, where space is hard to come by, but Weinstock said she believes her trade is necessary everywhere, including parts of the country where homes are larger and storage more plentiful. “If you live in a New York City apartment and you try to pretend it’s the size of a suburban home, then you’re going to battle your belongings every single day,” she explains. Weinstock’s apartment, as she describes it, is immaculate. She can’t remember a time when she left dirty clothes on the floor — it’s just not in her nature. When she visits a friend’s apartment, Weinstock says they always remark on how embarrassed they are if their place is untidy. No need to worry, she reassures them. Your Turn: Would you use a decluttering service like Weinstock’s?